4 Bedroom House For Sale in London for Offers in excess of £825,000. A beautifully presented, luxury four double bedroom townhouse set within the sought after Greenwich Square development located within close proximity to Maze Hill Station. 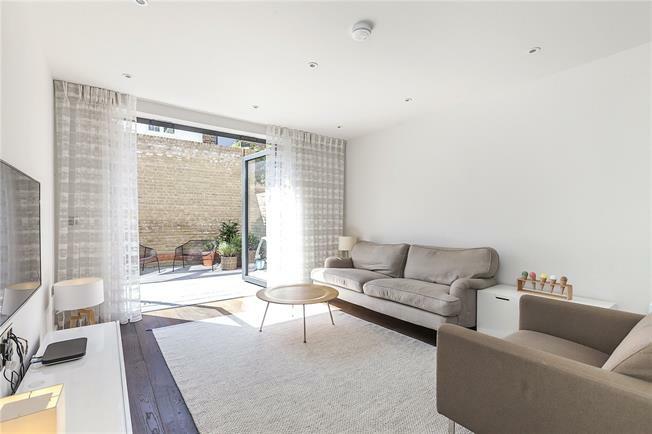 This modern townhouse features a reception room with open-plan kitchen which is incredibly light due to the high ceilings and full width bi-folding doors leading onto the lovely south-facing paved garden. Also on the ground floor is a guest WC and ample storage provided by a number of cupboards and closets. On the first floor you will find the master bedroom featuring an ensuite shower room and built-in wardrobes and the second bedroom which has access to it's own private balcony. On the top floor are an additional two bedrooms both of which have use of the family bathroom. The property has been finished to a high specification with underfloor heating throughout and has a stylish and contemporary decor. There is also parking available within the development and with it's great transport links and a great choice of schools in the local area, this house would make the ideal family home for any discerning buyer. Hawthorne Crescent is located within easy reach of Maze Hill train station offering fast and easy access into both The City and Canary Wharf including an 11 minute train journey to London Bridge Station. The open spaces of both Greenwich Park, Blackheath and East Greenwich Pleasaunce are a short walk away as are all the amenities of Greenwich Centre on the door step including a swimming pool and kids swimming pool, gym, library, doctor and dentist.